Obadiah Bourne Buell is a self-taught craftsman working primarily with stone. Homeschooled on the family quarry in Sullivan, Maine; Obadiah learned stone-working techniques at a young age and has been working with stone for over 25 years. As a part of the lifelong learning experience, Buell has been influenced by Maine’s natural beauty, world travel and a deep connection to Spirit. Obadiah’s attention to detail and passion for his art are expressed in every piece. 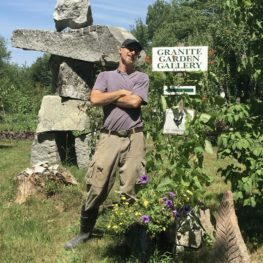 Currently, he creates both artistic and functional stonework for the home and garden at the Granite Garden Gallery in Sullivan.